DELTA JUNCTION — Telling your wife you just got a great deal on a small herd of yaks wouldn't go over well in every family, and Mary Kaspari is not the kind of wife who goes along with everything her husband, Phil Kaspari, has to say. For example, she insists on pronouncing their name with the i on the end, even though the rest of the family says Casper. But yaks make a surprising amount of sense in Alaska. After eight years, the family's farm east of town has 125 yaks, nearly enough to make a profit, according to Phil's business plan. Yak is on the menu at a couple of restaurants here and in Fairbanks and will soon be available in Anchorage. Mary is a registered nurse and health care leader. The opportunity to buy the yaks intrigued her. "She got kind of excited about the health benefits of this yak, and the real lean meat," Phil said. "It's all grass fed. One of my daughters did a school report on it and we got real interested in it." Mary has boundless energy and a wicked sense of humor. Phil is calm, friendly and understated. He corrects her when she embellishes a story. She calls him "this one," and asked me to find out if anyone wants to buy a yak farm. As we talked, their teenage daughter Grace tried to keep her distance. We stood between a yak herd and rows of round hay bales that Phil had taken a break from hauling. The heat of the day still lingered in the extended sunset of summer. To the south, the evening light picked out the jagged peaks of the Granite Mountains. To the north, towering thunderheads glowed gold as they rumbled and flashed. Phil and Mary have been friends since school in Minnesota but went their separate ways as young people in the early 1980s. Mary moved east and got a husband. Phil got an agronomy degree and planned with a cousin to take over his family's farm in North Dakota. But the farm economy was in crisis nationally. Willie Nelson was holding benefit concerts for family farms like theirs. The business didn't pencil out for young farmers starting. The cousin went back to school to study medicine. Phil left for Alaska. The state's top-heavy project devolved through errors, lawsuits, bad luck and a crash in the price of grain but some farmers hung on. Lucky ones collected federal conservation payments for leaving their fields to nature — the fields state money had just paid to clear. Phil worked for a potato farmer and rented land to farm hay on his own. It was a close-knit pioneering community. The farming was risky and hard but it was exciting to be building a new agricultural region. Those who hung on survived with modest ambitions and a lot of their own work, as farm labor is scarce and expensive here. Outside jobs or working spouses back up most Delta farmers. 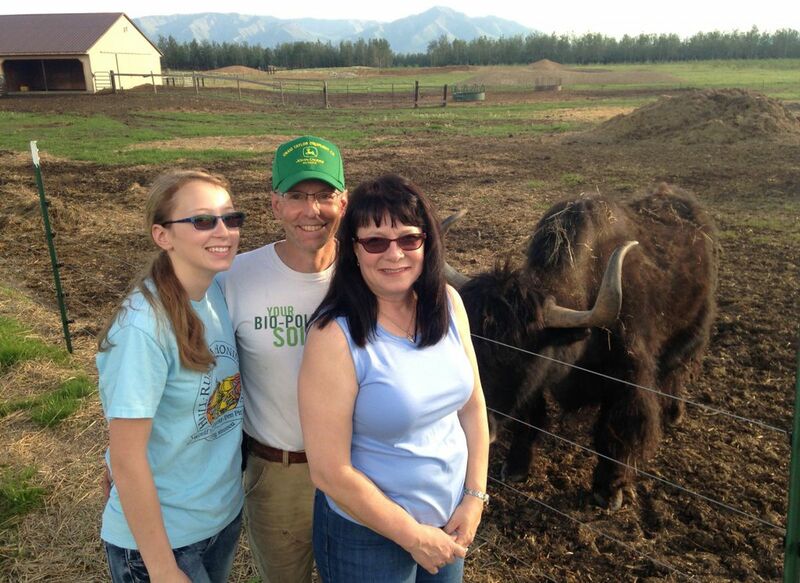 Phil kept farming but also became a University of Alaska extension agent. He and Mary were in their mid-30s when her husband died of a sudden heart attack. They had remained friends and he came to her aid. Their relationship was built on something deeper than romance. Mary declared, "Never marry a 35-year-old bachelor farmer from Alaska." But in a softer voice she told me: "It wasn't chemistry across the room. It's just we've been buddies for years. He's always the guy I would turn to." The farm is tidy and so is Phil, in a John Deere cap and Carhartt pants. And he is tough. Three years ago, he was working alone when a bull yak butted his leg without warning and threw him high in the air, twice. He climbed back on his tractor, tied the injured leg in place with string from a hay bale and continued working, calling Mary to say he would need her to look at it when she got home. The leg was severely broken. He wore a brace and needed 30 days of bed rest. He was still on crutches when his son-in-law, Steve Bealer, was severely gored in the thigh and chest by the same bull, breaking vertebrae in his back. "He's alive, and we have a grandbaby," Mary said. "If we're trying to promote yaks, I don't want to tell people they're dangerous," Phil said. "But you're working with animals and things can happen." Yaks come from Nepal, Tibet and China. Besides their lean meat, which sells for much more than beef, their coat is as fine as the qiviut wool from musk oxen, they are excellent mountain pack animals and they can even give milk for exotic cheeses. Milk is the only thing the Kasparis haven't tried. They have combed yaks with an afro pick and trained them to halter. They sold some yaks to a mountain guide who brought Sherpas from Nepal to break them for packing. Yaks' adaptation to the Himalayas helps them thrive in Delta's minus-50-degree winter temperatures and biting winds. They don't need high-quality feed and their coats are so thick they eat a tiny fraction of what other livestock consume during the cold months. Phil has come a long way with the farm. He bought 425 acres, cleared it, bred his herd and fenced them with endless labor. A large log house now stands on a rise overlooking the barn and the fields. Mary recently started a community health center in Delta, runs a 10-bed long-term care facility and is trying to start a small critical-care hospital. Phil is building a handling facility to make it safer to catch the yaks. They'll work it out between them.